Although, to be fair, math is hard. Hypatia of Alexandria was Greek mathematician, philosopher, and astronomer that lived and taught in Alexandria. She was accused of satanic sorcery by a Christian mob and murdered. This was partially because of her use of the astrolabe, an intricate device that was used by the Greeks to predict the path of the stars, tell the time, measure angles, and later on even measure latitude. It was probably the most advanced device in the ancient world, and in many ways the technological precursor to mechanical watches. At the time of Hypatia's death, Alexandria was the intellectual center of the world, where philosophers and mathematicians gathered to teach and debate ideas from across the known world. Hypatia taught Platonic philosophy, Ptolemy's system of celestial movement, and the advanced mathematics of Euclid (her father was the one who brought Euclid's Elements to the city). She was known as a gifted teacher, and undoubtedly one of the greatest thinkers of the time. Her death was in many ways political, with the religious zealots trying to seize power and purge the more free thinking pagan philosophers. Some historians mark this as the turning point of the Alexandria as the hub of intellectualism, and the library was burned soon after (although this is controversial, to say the least, and probably not related). 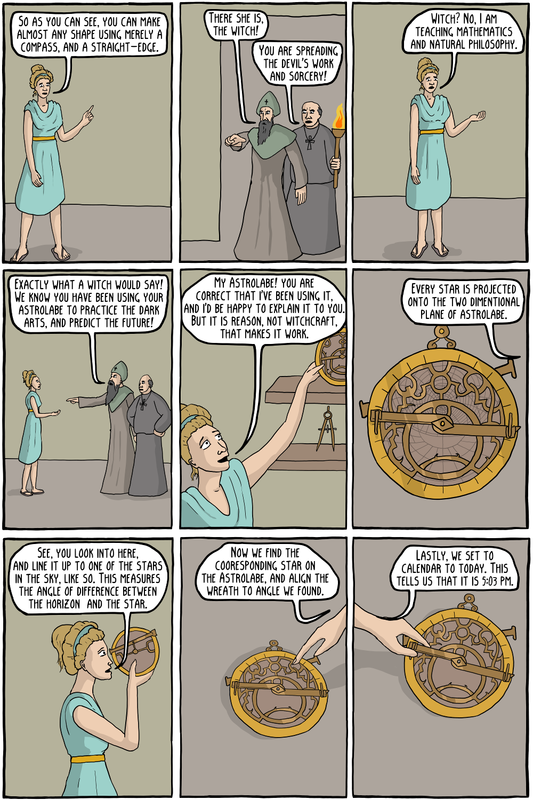 Most of Hypatia's original work was, as you might imagine, lost. After all, typically when you murder someone for heresy, you don't preserve their writings for future generations. Note that many historians believe a political power struggle between Orestes, the governer, and Cyril the Bishop was the real reason she was killed. According to this account, it was her political affiliation more than her religion or philosophy that caused her downfall, the as the Christian followers of Cyril blamed her for turning Orestes against them (who was also a Christian). If it was her philosophy, it is a bit ironic that the tradition of Platonism, Ptolemy, and Mathematics (and even the astrolabe) was preserved in Europe primarily by the Christian intellectuals.